Regardless of whether you are designing a hotel, a casino, a church or a courthouse, an entryway is a first impression. It sets the tone for the building, and provides visitors a sense of the space they are about to enter. Because of this, it is important that architects pay special attention to the impression they intend to convey with a building’s entryway. An entryway can convey a wide range of impressions. They can be dignified, somber or even vivacious, but no matter what the entryway says, it is important that they match the tone of the building they introduce. Stromberg Architectural provides a wide selection of architectural fiberglass custom entryways. While Stromberg Architectural Products has several stock entryways to choose from, they will also work with you to provide a completely original and unique entryway to distinguish your project. Architectural fiberglass is an amazingly versatile building material, and Stromberg’s professional molders can manipulate it to imitate just about any building material and architectural style. Every building project has a budget, and it can be very easy to overpay for custom architectural details. Fortunately, architectural fiberglass allows contractors to shave valuable expenses off the budget. Gothic or modern, the pros at Stromberg will work with you to custom build the most fitting and affordable entryway for any building. Traditionally, entryways are made out of stone, brick or even metal; however, those building materials are heavy, cumbersome and require specialized experts for installation. Fortunately, architectural fiberglass is light-weight, and easy to install. Furthermore, since architectural fiberglass is so light, it requires very little in the way of architectural support. Whether you are constructing an entirely new building, or adding onto an old one, entryways in architectural fiberglass from Stromberg are the perfect fit. You might think that you would trade durability and strength for simplicity, but with architectural fiberglass entryways, you can have it all. Architectural fiberglass is water-tight and weather-resistant. Moreover, it is extremely tough and will not corrode, rot or delaminate over time. Architectural fiberglass doesn’t only make construction easier, it is also easier to maintain over time. Architectural fiberglass is water-tight and weather-resistant. 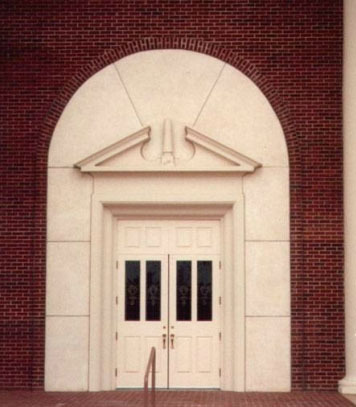 Stromberg’s expert craftsmen can customize your architectural fiberglass entryway to your unique specifications to produce an original entryway, sure to impress. Architectural fiberglass can stand up to the elements, and is resistant to corrosive agents like smog and acid rain. The artisans at Stromberg Architectural Products will work closely with you throughout the process to make sure your finished architectural fiberglass entryway is made perfectly to your specifications.